Typhlosion in game: 595 Who? Important notice! 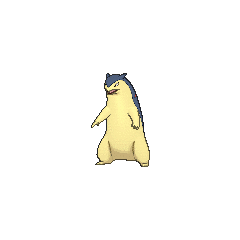 Pokemon Typhlosion is a fictional character of humans. 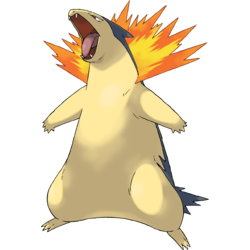 Typhlosion (Japanese: バクフーン Bakphoon) is a Fire-type Pokémon. Gold's Quilava, named Exbo, evolved into Typhlosion to protect Silver, Crystal, and himself from Lugia. 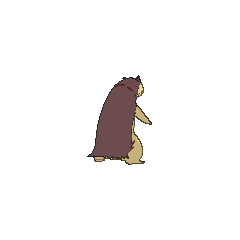 Afterwards, its larger size allowed it to be a method of faster travel (akin to Crystal's Arcanine), and with its increased power allowed Gold to hold his own and even overpower the Masked Man. 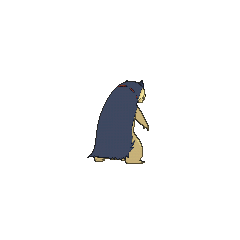 Another Typhlosion was seen under Ultima's ownership, displaying its Blaze Ability alongside her Meganium with its Overgrow. Doing so damaged much of the surrounding landscape, as well as a large girth of the ship nearby, earning the old woman much ire. 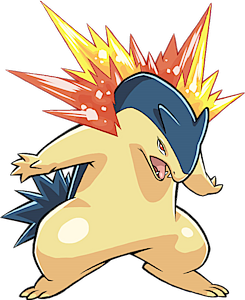 Typhlosion obscures itself behind a shimmering heat haze that it composes using its intensely hot flames. This Pokémon composes blazing explosive blasts that burn everything to cinders. It can hide behind a shimmering heat haze that it composes using its intense flames. Typhlosion compose blazing explosive blasts that burn everything to cinders. 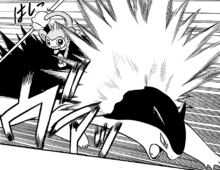 It attacks using blasts of fire. It composes heat shimmers with intense fire to hide itself. 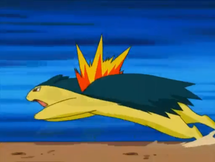 Despite being introduced in Generation II, Typhlosion did not make its core anime series debut until Gonna Rule The School, which was a generation later. The appearance of this Pokémon is mainly based on the honey badger. It may also be reminiscent of weasels and wolverines. It has a long and agile body, like weasels, though it is significantly larger and thicker than its pre-evolutions. Cantonese Chinese 火暴獸 Fóbuhksau Literally "Fiery violent beast"